This prompted me to share the lessons from the book The First Princi.pal - Based on the life and times of PS Mani Sundaram and presented to me by Sunil Malhotra the author himself. 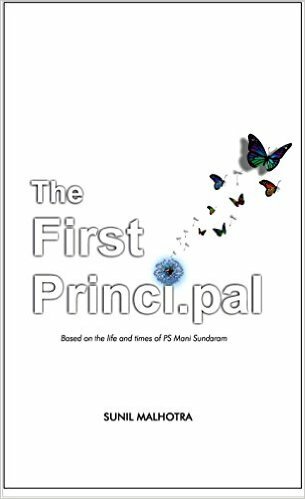 Am taking the liberty of quoting from the book as this is a requiem for leadership, it is a story of the teacher in each of us, the leader within and the principles of the Principal. Princi is that invisible great walking along a crowded beach as the waves wash away the footprints in their wake. His are the only footprints that will endure stubbornly. Like the man himself. Leaving his stamp of greatness on eternity. 1. Great leaders act decisively. 2. Empower people and provide the enablement to allow them to discover their own potential. 3. Keep the environment clean to induce orderly and productive behavior. 4. Let them be but don't let go of them. 5. Get the job done instead of trying to change people. 6. Measure the extent of social integration by the integrity of your culture. 7. An institution is built on values that last beyond the lifetimes of its makers. 8. Spirit of the law is more important than the letter. 9. Never let personal friendship compromise over professional responsibility and vice versa. 10 No act of kindness is small. Acts of caring can turn lives around. Finally, the lyrics of Pink Floyd will top it all! Yes, you will find more in the book and these vignettes are not even a glimpse, live the life of a visionary and read the story of Prof Sundaram the founder of REC Trichy, now NIT. The content above has been reproduced after a conversation with the author, as the book is so complete, I have not dared to review it! In this book, you will see your story, a story of most unsung heroes and what is takes way beyond pecuniary reward to build great leadership.